I did a tests on a couple days with very similar results — the results below are for the 2nd day (7/21/13). Both were very sunny days with no visible clouds or haze, and light to no wind. The ambient temperature was mid 80’sF at the time of the test. Not ideal for testing a space heating collector, and I will repeat the test when we get some cold weather. For the test, the outlet duct flow velocity for both collectors was adjusted to 235 ft per min. This is the velocity of the pop can collector with the flow adjustment shutter all the way open. 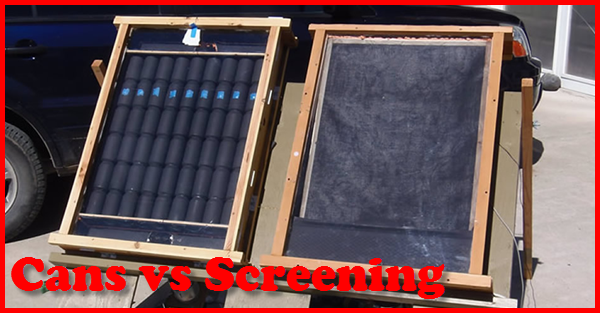 The screen collector has a bit less flow resistance and the shutter was closed part way (as shown in the picture above) to cut its velocity down to 235 fpm. The area of the 4 inch duct is 0.0872 sqft, and the resulting flow rate is (235ft/min)(0.0872 ft^2) = 20.5 cfm, or 3.4 cfm per sqft. For example: At 1:40 AM Heat Out = (61.3F)(20.5 cf/min)(60min/hr)(0.061 lb/cf)(0.24 BTU/lb-F) = 1104 BTU/hr (or 184 BTU/hr per sqft of collector). The air density is low due to our 5000 ft elevation (sea level standard air density is 0.075 lb/cf). So, for this test the heat output from the screen collector was about 6% higher than for the pop can collector. This may change for more typical winter heating conditions. Update: I did repeat some of the performance testing in winter conditions. The performance of the two collectors was closer and nearly equal. At one point I noticed a slight filmey coating had appeared on the inside of the pop can collector glazing. I took the glazing off and cleaned the film off, reinstalled. After a few minutes, the temperatures settled back in to where they had been, so the film was not opaque enough to make any difference. Not sure what caused the film — perhaps outgassing from the paint. At one point I reversed the two thermometers just as a check on their calibration. After a couple minutes, they settled down to very close to the old readings.